Incorporating three distinct interventions, the project has gained considerable support from both local and central government, key strategic and community stakeholders including the strategic growth partnership, government departments and key agencies. The project is now ready to move from design and feasibility to planning and delivery of its three key interventions: Foyle Reeds, Foyle Bubbles and Foyle Experience. An estimated £20-25m capital investment is anticipated across the three elements, to achieve significant economic, tourism and health benefits for the city and wider North West region. So watch this space for more information, and if you think you would like to be involved please get in touch below. The project began following a review of health and well-being undertaken by the Public Health Agency (PHA), which, in consultation with local partners, identified that additional capacity and expertise were needed to stimulate new ideas and working arrangements to bring about sustainable change in behaviours and perception surrounding the River Foyle. A partnership was developed between the PHA and the Helen Hamlyn Centre for Design (HHCD) at the Royal College of Art (RCA) in London was developed. Since March 2016, the team has worked extensively with local stakeholders and the public to create a community-driven organisation that is Our Future Foyle. 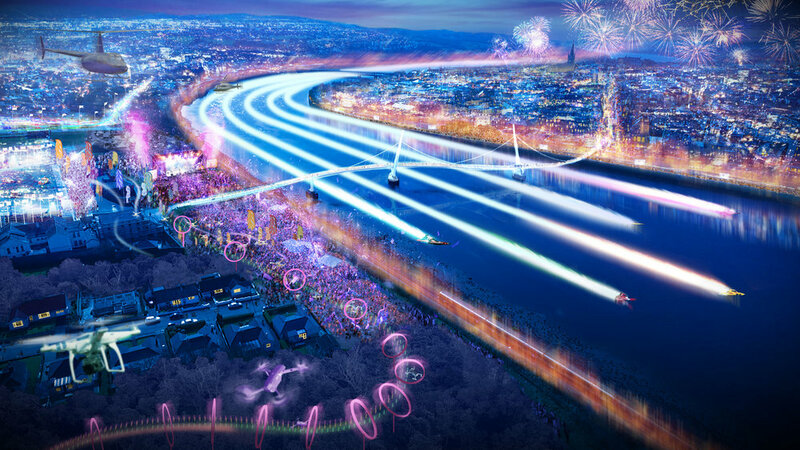 To date, using a range of innovative approaches in city-wide events, more than 5,000 individuals have given feedback concerning how the river could be used to its full potential. The team based in the city consists of ‘place-makers’ - sensory, experience and architectural designers with the focus of delivering innovation through urban stewardship. Our Future Foyle is leading the way in improving people’s physical, mental and social health through place making and animation. ﻿Employing a holistic and community engaged approach, Our Future Foyle’s, three resulting social and cultural interventions will address general health, well-being, education, employment, tourism and community-specific agenda. The proposed interventions will use design, art and digital innovation and collaboration with high profile technology partners and the Royal College of Art to inform social change about mental health and civic betterment through the continuing regeneration of the river. More than 40 portable spaces will occupy the riverfront and bridges. 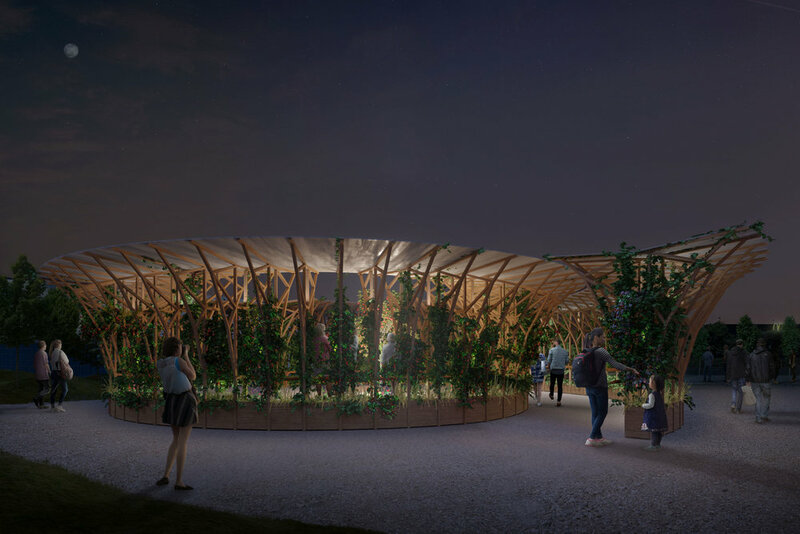 Each pod “bubble” will offer affordable space to existing arts and commercial organisations, business start-ups and individuals to animate the river bank. Each occupier will undertake mental health training and offer educational alternatives as they interact with the community. They will act as an onsite community response to incidents on the river, creating a network and eco system of support on the riverfront. The team is working with two high profile technology partners in embedding digital innovation into the spaces, which has never been tried before in urban space.The pods will interact with passers-by using embedded actions that can answer questions from tourists, change in colour play songs and through sensor technology predict human behaviour – from pedestrian flow to day and night activities which will inform long term regeneration of how the city is used. The pods will have the ability to communicate with one another through lighting and sound outputs to influence how people move and occupy the streets and walkways of the city: one of the most digitally interactive wayfinding interventions within the UK and Europe. The interactive installation would be the largest public art sculpture in Northern Ireland, and has the potential to inform global-learning on suicide prevention for other cities worldwide. 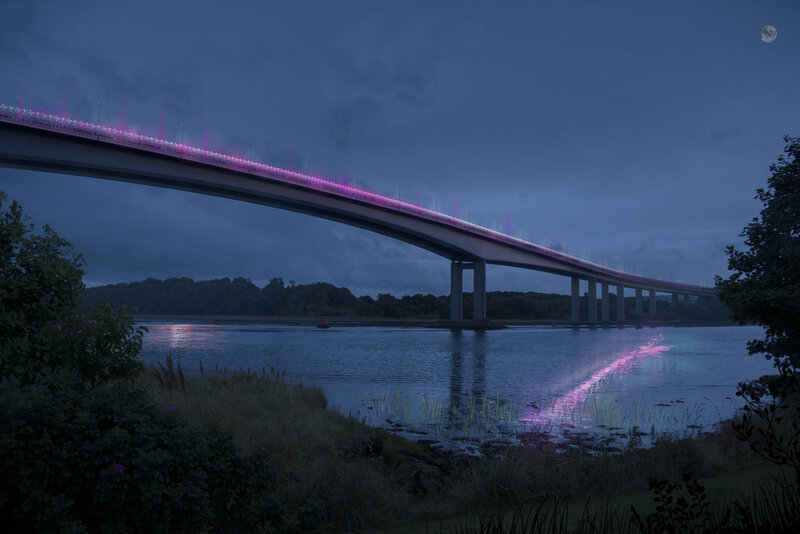 Through its sculptural form and dynamic illumination, it aims to promote a new perception of the bridge as a positive landmark with a sense of community ownership, whilst also acting as an effective suicide prevention barrier. Marking the liminal space between the water of the river and its banks, and linking the Atlantic Way and Causeway Coastal routes, the sculptural installation on the bridge will act as a gateway between Ireland and Northern Ireland. By reimaging the Foyle Bridge as a sculptural landmark it has the potential to match and enhance the tourism profile of its sister Peace Bridge, and the wider city. It will create an iconic and dynamic tourism attraction that can change colour via the control of an app, marking occasions for celebration in the life of the city, groups, sponsors and individual citizens. The potential for sponsorship is a unique opportunity for substantial annual revenue towards maintenance, and further digital regeneration interventions tackling mental health. A first of its kind globally this project has the potential to lead the way in community digital interaction within Europe and globally. The third element of the project is a series of cultural and contextual wayfinding points around the riverfront, designed to increase people’s desire to use the space and to promote digital innovation through social media and events interaction. Sensory and playful sculptures will draw people around the river, increasing footfall and improving navigation whilst reducing isolation and enhancing city connectivity. The main theme of each installation will look at the integration of digital technology and social media into the city. 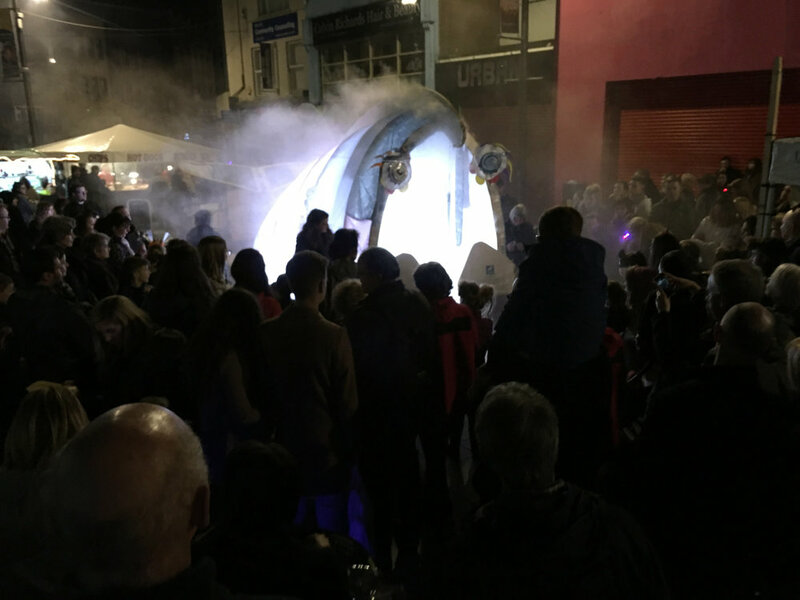 This will be community-focused, encouraging public participation and civic interaction so the sculpture adapts and changes with the community and an annual events programme. A funded open call to artists will bring together major digital innovation designers, architects and artists to create the largest digital sculpture park in Europe which will make Derry / Londonderry the most innovative art and digital trail for residents and visitors alike. The project has cross-departmental significance and strong strategic policy fit including with the Programme for Government, the Ebrington redevelopment, Foyle River Gardens, the Multi Modal Transport Hub, the Urban Villages initiative, the Community Development Plan and Strategic growth plan as well as shared outcomes of the emerging city deal. It incorporates extensive high-quality design and has evidence of community engagement. Landmark status - conceptual link between the Wild Atlantic Way and Causeway Coast There is potential for the project to have a transformational impact, for example, providing an improved gateway/regional link between the Wild Atlantic Way and Causeway Coast. Cross-border buy-in from knowledge and transfer with global outreach potential and knowledge transfer to other locations. Major civic space since the peace bridge, building on its legacy and the city of culture. The project would build on the positive successes and achievements of this flagship SEUPB project and address this directly. The project promotes strong cross-community relationships and cohesion, through the location of the bubbles and promotion of the riverfront as a shared platform, while making the space more accessible and safer. Uniquely, this project has the ability to achieve city scale transformation and make a positive direct impact on thousands of lives, potentially influencing a city population, and a 400,000 a year tourism cross-border remit with more than 30 organisations invested into its cause. The project focuses on the surrounding banks and bridges of The River Foyle in Derry-Londonderry, Northern Ireland. As a research and design project the aim is to promote the use of these spaces for wellbeing and community events. Improving the space for local people and visitors and to move away from the negative connotations the river has today. The project is supported by the Public Health Agency, Northern Ireland, in collaboration with local community, voluntary, public and private sectors.